Rocky road to closing larval cycle yields excellent results. The mystery of how to close the larval cycle of lobsters on a commercial scale has eluded science since the 1960s. But now there are some answers, thanks to researchers at the University of Tasmania. Associate Professor Greg Smith is Director of the ARC Research Hub for Commercial Development of Rock Lobster Systems at the University of Tasmania’s Institute for Marine and Antarctic Studies (IMAS). Associate Professor Smith said the primary goal of the Hub research team on the project was to develop a sustainable rock lobster aquaculture industry. And they're getting very close to solving the mystery. Rock lobsters have a lengthy larval development, far greater than any other commercially cultured marine species, and this has been a major barrier to the development of an industry. “There is an established industry in SE Asia that collects seedstock from the wild and grows them in sea cages. We would like to look at alternate ways to culture animals to maturity using sustainable practices that are being developed at the University. “We work on the Southern Rock Lobster and Eastern Rock Lobster, however our focus at present is the tropical lobster. This species has some favourable traits for aquaculture including the shortest larval duration of spiny lobster, three to four months, fast growth to a one kg market size in less than two years, and strong market demand. We have been able to develop a commercial larval diet, this has been critical to the success of this program. Without the right diet, the animals wouldn’t thrive. As well as the perfect diet and water, the lobster culture tank is also of crucial importance. The tank must have the appropriate water flow dynamics, so there is interaction between the lobster larvae and their food. They literally have to bump into their food to find and eat it. And while the initial goal of the ARC Hub has been achieved, the next challenge is developing systems to grow lobster juveniles. The Hub team has secured a partner to build the world’s first lobster hatchery and develop a new industry. “Going forward our project will have a diverse focus that will include diet development for juveniles and adults, maximising juvenile lobster culture practices and examining the economics of lobster culture. “Our aim is to develop lobster culture systems that will perform in an economical and sustainable way. We will investigate how current ideas on lobster aquaculture can be developed to produce this highly sought after product in a sustainable way,” Associate Professor Smith said. There are plenty more discoveries to come. This University of Tasmania research partners with the Australian Research Council, Tasmanian Government, UTAS Nexus Aquasciences, University of the Sunshine Coast, the University of Auckland, and Plastic Fabrications. Associate Professor Smith is a researcher based at the Institute for Marine and Antarctic Studies (IMAS), Taroona. 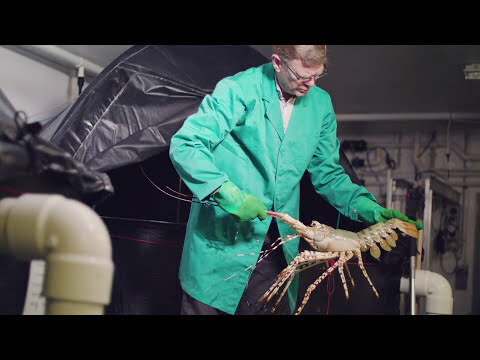 He has a strong interest in crustacean larval biology, the use of ozone for water treatment, development of novel hatchery infrastructure, and the commercialisation of new species. During the past 16 years he has focused on the development of spiny lobster larval rearing techniques and the development of associated infrastructure. He has successfully cultured four spiny lobster species; three of these through protracted larval phases to juvenile. He is the Director of the ARC Research Hub for Commercial Development of Rock Lobster Culture Systems. He is strongly focused on delivering commercial outcomes for industry. Research paves the way for Moreton Bay bug aquaculture in Tasmania. Sustainable rock lobster industry now possible after 17 years of research advances.